Exostoses are bony growths of the external auditory canal as a result of long term exposure to cold water and wind. Most of the time either prevention of water entering the ear canal or ensuring any water is removed after swimming will manage the condition adequately. Occasionally when there are recurrent infections, constant blockages, and even hearing loss, surgical intervention is required. This often occurs when the canal itself is narrowed by more than 80%. Please contact us for a formal assessment, and further information regarding simple control measures or whether the need for more interventional management is required. 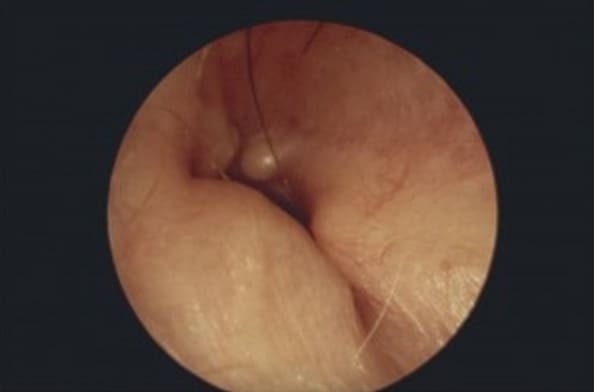 An image showing significant bony narrowing of the external auditory canal. The ear drum cannot be seen due to these growths.